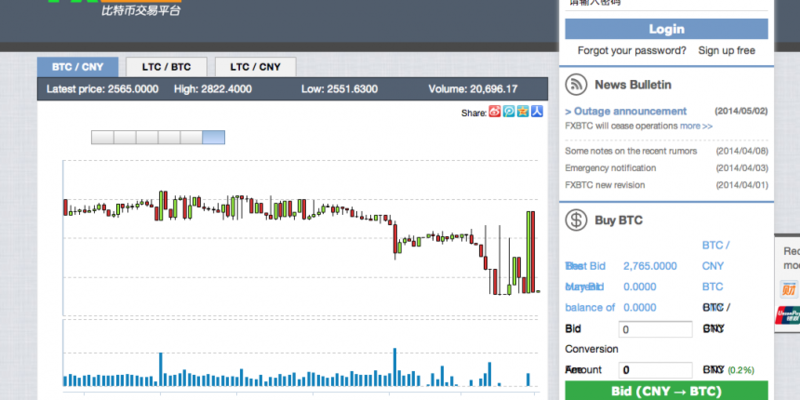 China-based bitcoin exchange FXBTC has announced that it will shut down on 10th May. In its announcement, FXBTC cited “unprecedented pressure” from the People’s Bank of China (PBOC) as well as restrictions on its banking services that have resulted from the central bank’s policies as deciding factors. FXBTC said that long-term financial losses stemming from what it termed a “blockade” by the PBOC resulted in the management team deciding to end the service. According to a translated statement from CryptoCoinsNews, the management team was unable to envision a successful future due to growing negative pressure from the PBOC. Users of the site have until 10th May to withdraw their funds, after which time FXBTC will officially close down. The exchange facilitated the sale and purchase of litecoins as well as bitcoins. The development is the latest in a broader push by the PBOC to seemingly limit the interaction its traditional financial services sector has with the digital currency community. FXBTC was one of several exchanges to announce new deposit freezes in early April, when it received word from commercial banking partners that they were looking to terminate certain accounts. FXBTC stopped debit-card deposits as of 3rd April and temporarily halted withdrawals. However, at the time, it confirmed that certain key processing partnerships were unaffected. In recent months, China’s central bank has quietly moved to restrict payment processors and banks in the country from dealing with domestic bitcoin exchanges. These developments – as well as rumors of future restrictions – have lead to periodic drops in the price of bitcoin. The developments began in March, when China-based financial news site Caixin reported that the PBOC would look to more strictly enforce its December rulings. That report indicated that China would be aiming to enforce this new interpretation by 15th April, though this deadline passed without the negative consequences many feared. However, as new reports of certain companies publicly distancing themselves from bitcoin and related services continue, many are speculating as to whether more widespread action could be forthcoming.